Just recently Google announced Google+ pages for businesses & brands. 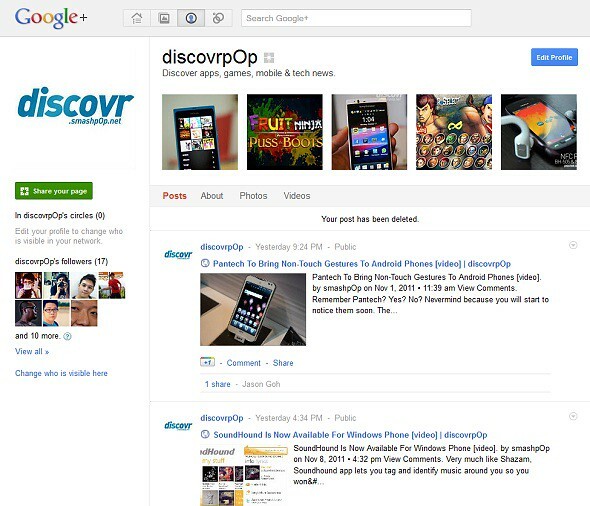 So we quickly went over there to snag one for ourselves and hence, discovrpOp Google+ Page is born! The page is still new and it will be updated whenever there is new post on this blog. Remember to circle it so you will get to receive all the latest tech and gadget updates right in your Google+ stream! Sooo convenient. Currently the page URL is https://plus.google.com/105632936212323230199 and we hope that Google will intorduce vanity URLs soon.. cos https://plus.google.com/discovrpOp is definitely nicer to look at. Let’s go and join in the fun! One Response to "discovrpOp Google+ Page Is Now LIVE! Come & Join The Fun"